Здравей! Greetings in Bulgarian. What fun it has been over the past several days to decipher the Cyrillic alphabet. Bulgaria was even better than I’d hoped for or expected to find. In many ways the country is at the crossroads — between east and west in terms of geography (evidenced by the scores of trucks en route from Istanbul to Bucharest, Berlin and elsewhere), culture and politics, yet in others overshadowed by those very same elements rooted in its neighbors. For example, it hasn’t had the notoriety of Romania thanks to its lack of an outright dictator, it avoided the dire effects of war in the Balkans despite the fact that they occurred on its doorstep, and once again current international interests lie just nearby in countries surrounding the Black Sea (with Bulgaria’s Black Sea coastline fabled for its beauty and now potentially in severe danger due to environmental abuse, overzealous property developers, holiday-makers and corruption). Even given all the problems and obstacles that still face it — not least EU integration, which is slated to occur over the next several years although while I was there some €2 billion in structural funds for the country were withdrawn due to ongoing corruption concerns — the country appears poised to move forward, with a charming citizenry, beautiful scenery and at least a few pockets of traditional architecture and culture “off the beaten path” that made our visit entirely worthwhile. After the car-rental-blessing-in-disguise episode in Bucharest and several missed turns (despite three maps in hand, we could not seem to avoid passing and re-passing the same smokestacks multiple times over), we got out of the capital and headed south on Route 5 towards the town of Ruse on the Bulgarian border. The border crossing itself was interesting and easy; it only took 10 minutes and 2 smiles to clear customs patrol, though no-person’s land between the two border checks was a maze of fences, dead-ends and roadblocks unlike any other I have ever seen. Kudos to the authorities for making sure no one could slip through territorial cracks. 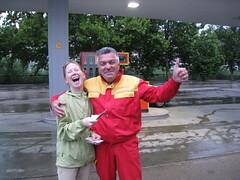 Just over the Danube, we stopped at Lukoil for gas. Finally saw the Lukoil name as it “should” be spelled (Лукойл) and were duly impressed by the selection of goods in the mini-market — brand new, shiny Western brands, from soda to iced coffee to French butter cookies. It felt slightly bizarre, not least because about 100 meters away were completely shoddy, dilapidated housing blocks that extended along the horizon for as far as the eye could see. Welcome to Bulgaria; at least from a housing perspective, Romania looked posh in comparison (which isn’t saying much). Driving southward was like walking even further back in time and back into nature. Broad horizons that were a mixture of forested hills, sunflower fields and chalky bluffs. Tiny villages lined with terra-cotta roofed homes, random shops, lazy roadside vegetable stands. The landscape, architecture and overall feel continually reminded of Umbria. I almost expected to find wild boar crossing the highway; no such luck, though there were plenty of painted horse-drawn carts to pass and cows grazing up to the road’s shoulder. Arriving in Veliko Tarnovo provided the perfect capstone to a magical drive. The place from which 22 successive tsars ruled Bulgaria during medieval times, Veliko Tarnovo (or just Tarnovo — Търново — for short) retains a stunning setting, complete with fortress and traditional architecture, and remains one of Bulgaria’s national treasures. It reminded me of a combination of Luxembourg (the Yantra River snakes through town, with homes and shops clinging to hillsides and river basins alike), Utah (imagine the red rock bluffs, only gray and mottled with trees) and the area around Cesky Krumlov in the Czech Republic. What a wonderful, unexpected surprise greeted us! We settled in to the funky, perfectly-located Studio Hotel. Everything item of décor is black, white or red, down to the velvet-brocade wallpaper and lava lamps. The rooftop terrace has a 360 degree panorama of the fabled fortress, onion dome of the cathedral and homes spilling over one another. It didn’t take long to surmise that we’d find this area endearing… and so nice to be at least a bit further off the beaten track again, without stray dogs, traffic congestion or non-stop city clamor. Tarnovo was the base from which we explored northern Bulgaria as a whole. We discovered better food (and wine), better prices, better drivers, and generally better scenery and better opportunities to enjoy nature than we’d found previously — and indeed, than we expected. It was just the change of pace and lifestyle we needed! We explored a few monasteries (Troyan, Dryanovo), traditional villages (Arbanasi, Bozhentsite, Tryavna and its famous woodworking school — complete with wood-carved ceilings, walls and even engraved family portraits!) and the Stara Planina mountain range. And last but not least, we took a not-to-be-missed detour to “my” namesake village of Apriltsi! Not that there was much to do there other than a handstand next to the sign marking the entry to town; mostly it’s just a long, thin stretch of ramshackle homes and buildings that winds its way along the local river and struggles to survive. The most interesting things to be seen there were a dilapidated rusty MIG fighter jet shell — yes, the entire plane — in the middle of someone’s front yard, and the goat-herder traffic jam at sunset. Goats appear to be revered in Apriltsi; they had the right of way and devoured residential trees while homeowners looked on without much care or dismay. We were lucky enough to visit the Troyan monastery right as evening mass took place; as if it were not enough that the monastery is exquisitely frescoed inside and outside, listening to the chant of priests amidst such beauty might be enough to convert some die-hard atheists. This experience was outdone only perhaps by our visit to Arbanasi the following day. Arbanasi was the summer getaway locale for nobility during the Ottoman empire, and even today it exudes an air of affluence and refuge. Our first fortuitous visit was to the Church of Saints Michael and Gabriel, where we had to wait for the caretaker to finish his lunch before opening the chapel for us. The upside of this was that we were the only ones there, amidst literally thousands of frescoes and gold-lined icons — amazing! Next we headed to the Nativity Church, where we figured we’d find equally good frescoes… but never did we expect to stumble upon a private impromptu concert by 4 male singers who performed traditional liturgical Bulgarian music. In the cool dim serenity of the chapel, surrounded by brilliant paintings and the hum of deep chords, the effect was mesmerizing and the memory unforgettable. Finally, mention of some favorite foods and drinks to round out our experiences. Although I am a big fan of mamaliga cu brinza (one of Romania’s national dishes, basically polenta-like cornmeal served with melted soft, tangy sheep’s cheese), the most memorable thing I ate in Romania was yogurt. Seriously. But what delicious yogurt it was — especially the watermelon, honeydew melon and rose-petal flavors. Otherwise it was just a lot of cabbage salad, sliced cucumbers, mealy potatoes and overdone meats. Bulgarian cuisine, on the other hand, revealed delights at almost every turn — not only in tastes sampled, but also in the endearing translations (one favorite: “fresh scvized frut juse” — when pronounced in Bulgarian, it sounds entirely correct!). Chilled tarator soup made with tart yogurt, chopped cucumbers, fresh dill and ground walnuts. Shopska salad of pulverized tomatoes, soft feta-like cheese, dill and (no surprise) cucumbers. “Salads” often having a consistency more like ratatouille, with the vegetables quasi-pureed and combined rather than sliced and served raw. Kadaief, which can only be described as a cold, shredded wheat-like pastry soaked in honey and is simply divine when served with a thimble of strong Turkish coffee. Speaking of coffee, and drinks generally, Bulgaria gets high marks. We had no problem finding good-quality and inexpensive Italian, Turkish and filter coffee, and one specialty is “coffee on sand” which is essentially old-school Turkish coffee that’s served in a copper pot heated by running it across warm sand. As for wine, Bulgaria is home to several grape-growing regions and good wines. A few varietals that were new to me include Mavrud and Melnik (which produce reds similar to cabernet) and Rikat (which produces a dry white). And then of course there is rakia, the liquor of national pride that can be made out of grapes, prunes or (my favorite) apricot. On that note, cheers — to another great trip!